The Philadelphia Eagles (2-4) traveled to Washington to take on the Redskins (3-2), in a must-win game for both squads. The Eagles looked to snap a four-game losing streak, and the Redskins aimed to keep an indefinite lead over the NFC East and snag an early division lead. The last time the Eagles went to Washington, Michael Vick went off and had his career game in a blowout win for the Eagles, and the Redskins looked to get revenge and defend their home turf. It didn’t go quite as well as planned for the Redskins, as the Eagles were able to grab a 20-13 win on the road. The majority of the loss for Washington can be pushed onto incumbent starting quarterback, Rex Grossman, who threw four interceptions in the game. Even though John Beck entered the game in the fourth quarter and led an impressive drive to bring the Skins’ within seven, the Eagles offense proved to be too much and were able to run-out the clock to finish the game. Considering that Kurt Coleman was benched earlier this season in favor of Jarrad Page — his performance in this game was amazing. Coleman was on fire, and was reading Grossman like a book, picking off the quarterback three times in the game. All of which could not have come at better times for Philadelphia, and a lion’s share of this win can be given to Coleman’s individual performance. For any doubters, Coleman showed why he should remain the starter and that Page is nothing more than a glorified backup. Andy Reid has been hesitant to run the ball early in games this season, whether that be because of his personal preference of passing the ball, or lack of faith in LeSean McCoy, Reid had seemingly avoided trying it. Against Washington, McCoy was handed the ball early and often in the game, and managed to rack up some impressive stats; 78 rushing yards on 17 attempts, and one rushing touchdown. Opening up passing lanes for Vick, and leading the Eagles to a big first-half cushion. Maybe it was because for the majority of the game the Eagles were defending Grossman, or that the Redskins have a weak set of wide receivers, but either way Philadelphia’s passing defense looked sharp. Throughout most of the first three quarters, Philadelphia played lockdown on the outside, covered the check-down, and did a great job over the top. Nnamdi Asomugha was playing like his Pro-Bowl self, and obviously Coleman led an impressive defensive performance for the Eagles. 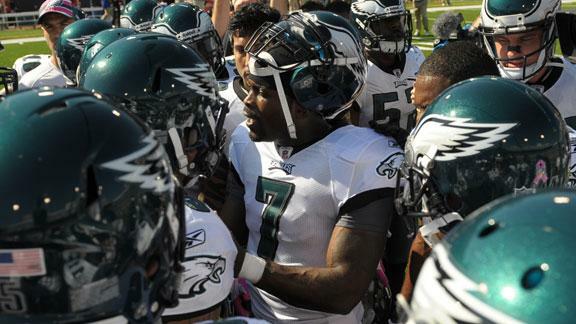 Michael Vick only threw one interception this game, and it was another that wasn’t his fault. When Philadelphia was in the red zone, Vick through over the middle of the field and the ball deflected off of Barry Cofield’s helmet and flew straight into the air, only to be caught by OJ Atogwe. Not to mention on a scrambling play, Vick went out of the game due to getting dirt under his visor, and while he was on the sideline, Vince Young threw an interception. As mentioned earlier, Young stepped in for Vick when he left the game for a few plays, and while he was in he accomplished nothing. When Young dropped back in the pocket, he looked unprepared, rattled, and just generally uncomfortable. On his first play he tried to scramble up the middle and ran directly into a Redskin defensive lineman, and on the next he threw a horrible pass directly into the hands of DeAngelo Hall for an interception. The Eagles may have won this game, but almost all of the credit should be given to the defense. For the third consecutive game this week, the Eagles offense was shutout and failed to score any points in the second half. It is quite possible that if Philadelphia would not have forced four turnovers in the game, they could have lost purely on lack of offensive success. I’m not sure if this is a problem with play-calling or players just getting comfortable, but is has to change if Philadelphia wants to continue to win. In reality, this may have ended up just being one win on the record, but it holds much more weight to the long-term success of the team. This win snapped a four-game losing streak, and also notched the Eagles a much needed division win in the NFC East. This will also help the Eagles with momentum heading into their bye week, and hopefully will carry through the remainder of the schedule. Philadelphia may have experienced some of the same problems they have in the past, but a win is a win, and this one couldn’t have come at a better time for the Eagles.